Ultra HD is the first TV format to be driven by the Internet video-streaming phenomenon. After attempts to hawk 3-D and OLED TVs fizzled in recent years, television manufacturers are taking small steps toward making a new technology, Ultra HD, more viable for mainstream consumers. It's the first TV format to be driven by the Internet video-streaming phenomenon, and at the International CES gadget show this week, major streaming players Netflix and Amazon said they'll offer movies and TV shows in the format, and Sharp introduced a relatively inexpensive TV with near-Ultra HD quality. The moves are meant to coax consumers to pedal faster on their TV upgrade cycles. At the moment, most Americans buy new TVs about once every seven years. TV manufacturers would love to create another wave of buying like the one that sent millions of people to stores a few years ago to upgrade from standard definition, tube TVs to flat-screen HD models. Unlike the 3-D TV trend, which quickly eroded into a tech fad in recent years, analysts say Ultra HD may actually catch on. With screens that house four times more pixels than regular HD TVs, Ultra HD is a simple enough upgrade to gain widespread adoption in the next few years. Aside from being visually jarring, 3-D required sometimes pricey special glasses and gave some people headaches. Because Ultra HD content can be delivered over a standard high-speed Internet connection, it isn't likely to get bogged down in a format war that plagued the Blu-ray disc standard. "You see it, you get it. It's a big, awesome picture," said Ben Arnold, a consumer electronics analyst at NPD Group. "Consumers will be interested in it as prices come down. Consumers are also moving toward bigger screens. All of this is good news for (Ultra HD)." In side-by-side comparisons, Ultra HD is remarkably crisper than HD. It displays richer skin textures, finer details and less pixelation. The extra resolution becomes more important as consumers spend more money on bigger screens that amplify images. But Ultra HD, or 4K, is in its very early stages. Although prototypes and demonstration models have been around for years, the first sets for consumer use didn't hit the market until 2012 with prices in the tens of thousands of dollars. Only about 60,000 Ultra HD sets were sold last year in the US, with 485,000 estimated this year, according to the Consumer Electronics Association. Today, the lowest-priced Ultra HD TV being sold on Amazon.com is a 39-inch model from Seiki Digital for $500. The cheapest name-brand manufacturer's model, a 58-inch screen from Toshiba, sells for $2,750. And LG announced this week it would sell an Ultra HD set as small as 49 inches diagonally, which could bring entry level prices closer to $2,000 for top brands. Sharp's new Quattron+ brand, which brings near-4K resolution to sets by making better use of HD pixels, plans to price a 70-inch set around $3,200. While those price tags are only likely to appeal to early-adopters, they're getting closer to prices people currently pay for big screens running only HD. But that still isn't close enough, said James McQuivey, principal analyst with research firm Forrester. "These TVs won't actually sell well as long as they are priced high, something TV makers already know because in the last year they've dropped prices considerably," he said. To entice consumers even further, a handful of content companies promised to make more movies and shows available for the super-sharp screens. Netflix Inc. CEO Reed Hastings made the rounds at news conferences Monday to declare that the streaming video company is working on distributing 4K video over the Internet. Hastings said all Netflix original series are being shot in 4K and that the company is working with studios on formatting movies and TV shows in 4K, with one of the first series being Sony's "Breaking Bad." Both Amazon.com Inc. and Hulu are shooting original series in 4K, and Amazon said it was working with major content producers Warner Bros., Lionsgate, 20th Century Fox and Discovery to make 4K content available. 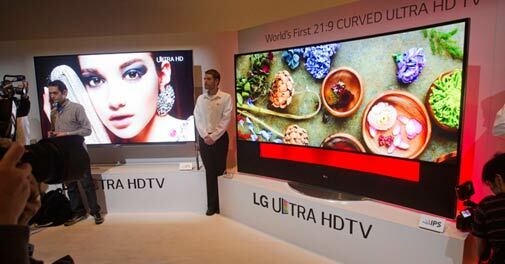 The emergence of Ultra HD marks the first time a major TV standard is being pushed forward with the Internet. "It's a chance for the Internet to really shine," Hastings said. Downloading huge Ultra HD files would take download speeds of only 15 megabits per second and could even work with a Wi-Fi connection, Hastings said. LG's chief technology officer, Skott Ahn, said that 4K content could be streamed with 8-15 Mbps Internet speeds using the latest HEVC video compression standard. It's not clear how close the industry is on a Blu-ray disc standard for Ultra HD. No announcements about a format were made at the show, even as The Digital Entertainment Group, an industry consortium of studios and electronics makers, declared that strong consumer interest in 4K "bodes well for the home entertainment industry." Enough people have to own Ultra HD sets for pay TV providers to start enabling service. If the CEA's forecast of 485,000 units sold in the U.S. comes true, that could provide enough of a base for cable, telecoms and satellite to begin to upgrade their systems, according to Pat Esser, president of cable TV provider Cox Communications, which serves about 10 percent of US pay TV subscribers. If 50,000 Cox subscribers buy Ultra HD TVs, "then you've got my attention," Esser said in an interview. Widespread adoption by live-TV producers still seems a ways off. Sony Corp. promised an end-to-end production suite for professionals, and Sony Electronics President Mike Fasulo on Monday unveiled a Handicam that shoots in ultra HD for the home enthusiast, priced at $2,000 - "As I like to say, 4K for $2K." He rattled off a list of upcoming movies, shows and live events that will be shot in 4K and offer something for ultra HD set buyers to watch, everything from Spike Lee's latest movie, "The Sweet Blood of Jesus," to the FIFA World Cup in June. "We're not talking about this as a science project 10 years into the future," he said at Monday's news conference. "This is all happening now."